What is the Northwest Passage? A Map and a History. Northwest Passage map: Red lines are possible routes for traversing the Northwest Passage. Geology.com/MapResources. Click to Enlarge Image. The Northwest Passage is a sea route that connects the Atlantic and Pacific Oceans through the Canadian Arctic Archipelago. In the past, the Northwest Passage has been virtually impassable because it was covered by thick, year-round sea ice. However, in the past few years, climate change is allowing commercial traffic to pass through the Arctic Ocean via this once-impossible route. The potential benefits of a clear Northwest Passage are significant. Ship routes from Europe to eastern Asia would be 4,000 kilometers (2,500 miles) shorter. Alaskan oil could move quickly by ship to ports in the eastern United States. The vast mineral resources of the Canadian North will be much easier and economical to develop and ship to market. Graph of arctic sea ice extent: Time series graph of the average monthly Arctic sea ice extent in millions of square kilometers. The average January ice extent for 1979 to 2014 shows a decline of 3.2% per decade. Credit: National Snow and Ice Data Center. There has been a progressive, year-by-year decline in the thickness and extent of Arctic sea ice. The graph on this page shows how the extent of Arctic sea ice has been on a steady decline between 1979 and 2014. NASA studies have shown that the extent of Arctic sea ice is declining at a rate of several percent per decade. As the ice cover is removed, solar radiation penetrates the water and warms it, instead of being reflected from the white ice. Another factor that contributes to warming of the Arctic Ocean is the increase in discharge rates of rivers draining from Eurasia. These freshwater rivers now receive increasing runoff from melting glaciers. This runoff is much warmer than the Arctic Ocean water. The net result is a slight warming of the Arctic Ocean waters and a dilution of salinity. Northwest Passage satellite photo: Satellite image of the Northwest Passage and Canadian Arctic Archipelago acquired on September 3, 2009. Image credit NASA / Earth Observatory. Click to Enlarge Image. The map at the top of this page shows possible routes through the Northwest Passage. Ships traveling west would enter the Passage through Baffin Bay, pass through the Canadian Arctic Archipelago by various routes, exit into the Beaufort Sea and then out into the Pacific Ocean through the Chukchi Sea and Bering Sea. The economic value of a short route connecting the Atlantic and Pacific Oceans was appreciated early. The Spanish referred to this route as the "Straight of Anián," and Francisco de Ulloa started searching the Baja California peninsula area for it in 1539. English explorers, including Martin Frobisher, John Davis, and Henry Hudson searched for it from the Atlantic side in the late 1500s and early 1600s. These expeditions were unsuccessful. Explorations continued through the 1600s and 1700s without success. Then in 1849 Robert McClure passed through the Bering Strait with the intent of sailing through to the Atlantic. His ship was trapped in the ice not far from making it to Viscount Melville Sound and probable passage to the Atlantic. Finally, after spending three winters on the ice and dying of starvation, McClure and crew were rescued by a sledge party from one of Sir Edward Belcher's ships and transported by sledge to the Sound. McClure and his crew became the first to survive a trip through the Northwest Passage. Norwegian explorer Roald Amundsen and his crew were the first to cross the Northwest Passage entirely by sea in 1906. Although the crossing was an important "first," it had little economic value because the journey took three years and used waters that were too shallow for commercial shipping. The first single-season trip through the passage was by Henry Larsen and crew in 1944. Again, the route taken was not deep enough for commercial shipping. 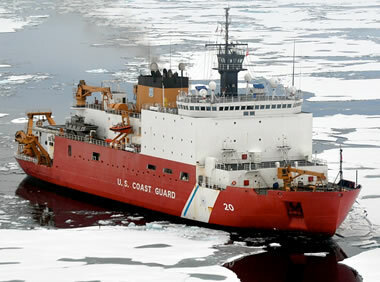 U.S. Coast Guard Cutter Healy, one of the United States’ newest and most technologically advanced polar icebreakers. Credit: U.S. Coast Guard photo by Petty Officer Patrick Kelley. In 1957, three United States Coast Guard Cutters - Storis, Bramble, and SPAR - became the first ships to cross the Northwest Passage along a deep draft route. They covered the 4,500 miles of semi-charted water in 64 days. The first ship capable of carrying significant cargo to traverse the Passage was the SS Manhattan, a specially reinforced supertanker, in 1969. It was accompanied by the John A. MacDonald, a Canadian icebreaker. This trip was taken to test the Northwest Passage as an alternative to building the Alaska Pipeline. At that time, it was determined that the Northwest Passage was not economical, and the Alaska Pipeline was built. International Waters or Canadian Waters? All routes through the Northwest Passage pass between the islands of the Canadian Arctic Archipelago. On that basis, Canada claims the route as "Canadian Internal Waters." However, the United States military has sent ships and submarines through the Passage without notification to Canada based upon the philosophy that the Passage is an International Water. This is one of many issues in the "who owns the Arctic Ocean?" question. 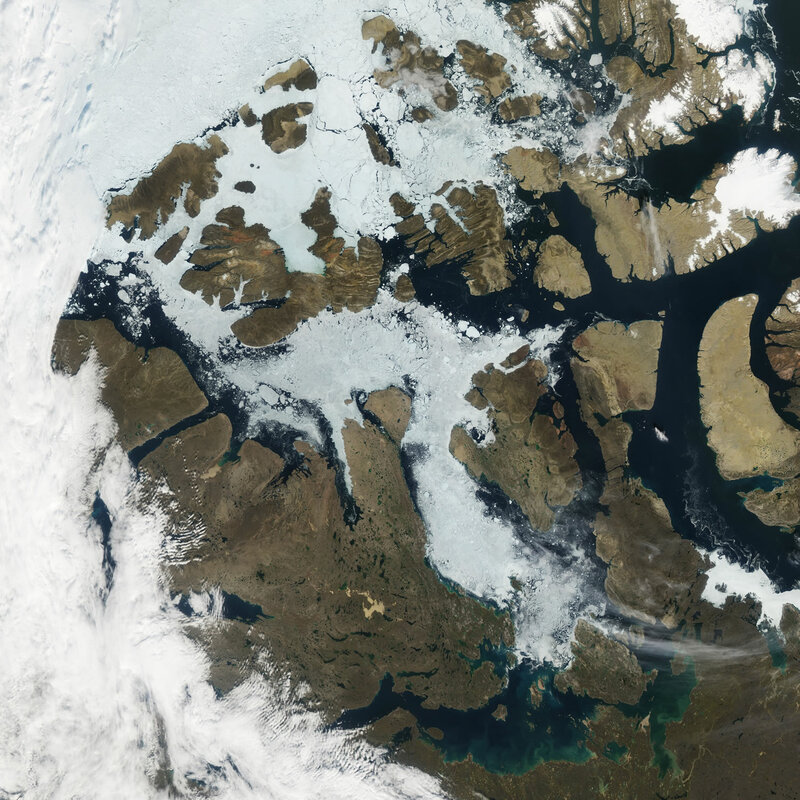 Commercial use of the Northwest Passage might be a very tiny benefit of climate change. Billions of dollars in transportation costs could be saved each year if the passage remains open and reliable for a few months of the year. There will also be time and energy savings. Canada has the most to gain should the Northwest Passage become a viable shipping route. This will facilitate Canada's development of northern lands and provide an important economic and military possession if their claim to control is upheld.